most important colony of king penguins, fur seals and elephant seals and it is estimated that over 10 million sea birds visit South Georgia each year. 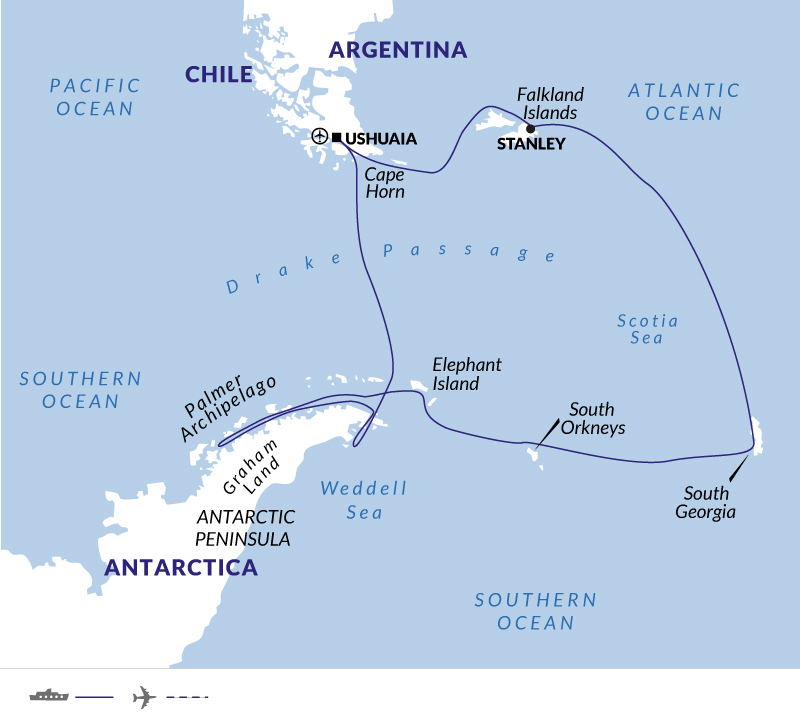 Our wildlife - rich journey continues as we set sail to the Falkland Islands. This archipelago of over 400 islands, is an important breeding ground for penguins, elephant seals and sea lions and we will have plenty of time to explore and admire its delightful offerings. This morning, your luggage will be collected from your hotel and transferred directly to the port for clearance and loading onto the ship. You will have the first part of the day to explore Ushuaia, before boarding commences at 4 p.m. After settling into your cabin there will be a safety briefing held out on deck, as you sail out across the Beagle Channel, with spectacular views over Ushuaia and Tierra del Fuego. This evening, you will have time to get to know your friendly crew and fellow expeditioners at a welcome dinner, celebrating the start of a thrilling adventure to Antarctica and South Georgia. Over the next four days, a host of choices are open to us and depending on ice and weather conditions, both flanks of the Antarctic Peninsula is ours to explore. Our experienced expedition team, who have made countless journeys to this area, will use their expertise to design our voyage from day to day. This allows us to make the best use of the prevailing weather, ice conditions and wildlife opportunities. We enter a world of shifting pack ice and vast tabular bergs in the Weddell Sea, where Shackleton's story comes to life. If ice conditions allow, we visit world-renowned fossil beds and bustling penguin rookeries. An abundance of wildlife can be found on the Antarctic Peninsula - from whales to rookeries, birdlife to seals - there will be plenty to take in over the next few days whilst we explore this frozen land. The scenery is simply breathtaking and we will have plenty of time on shore and in Zodiacs, to soak up our surroundings. Toast to a successful voyage at a celebratory dinner and drinks with your fellow expeditioners, as we make our way across the open sea to Ushuaia. Information There are no transfers provided on the last day of your tour, please advise if you would like us to arrange these for you.